Tuesday, July 2nd at 7:00 p.m. Known as “All brass no ammo,” the 195th Army Band Brass Quintet features five of the full concert band’s finest brass players. Joined by the Saxophone Quartet to perform a range of Patriotic medleys, Broadway show-tunes, lively Ragtime rags, Polkas and Glen Miller big band style music, this Soldier Music Support Team is sure to provide an evening of spirited entertainment. 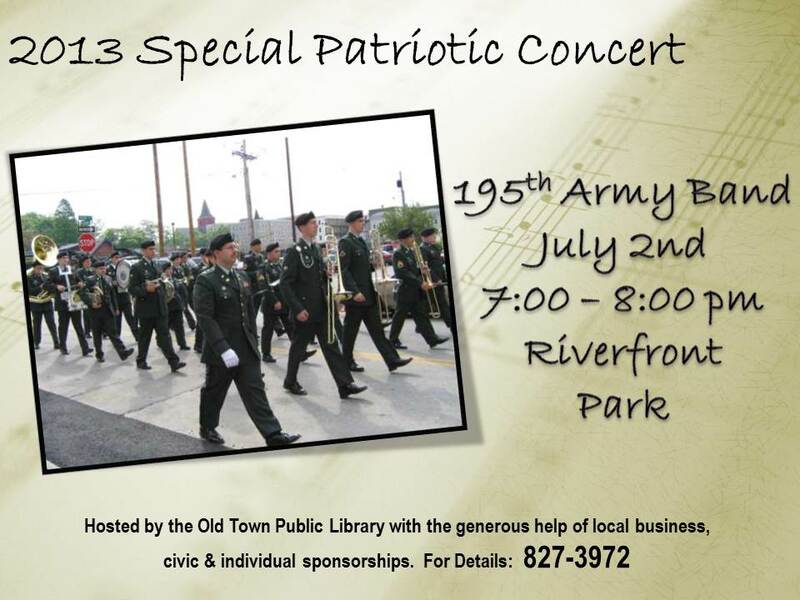 Bring your blankets and chairs and join us at the Riverfront Park for an evening of great music. In the event of rain, the concert will be held in the Library Meeting Rooms at 46 Middle Street.